At the time of construction they were the most powerful engines ever installed in railway traction. The 12 cylinder twin bank engines were each rated at 2,200hp at 700 rpm on the one hour rating. Cylinder size was 310mm by 390mm (12.2in by 15.4in). Electrical equipment was supplied by les Forges et Ateliers de Constructions electriques de Jeumont, each half unit having a main generator, three traction motors, an axle driven exciter, an auxiliary generator and other subsidiary equipment. The total of six tractions motors are of the four pole series, with forced ventilation, permanently coupled in parallel. The motors have single armature winding, applying power through two pinions to a quill shaft concentric with the axle turning in pad lubricated bearings forming part of the motor body. The hollow shaft is fitted with two pinions attached by clamp plates. A Kleinow A.E.G. type flexible connection is fitted between the quill & the axle. 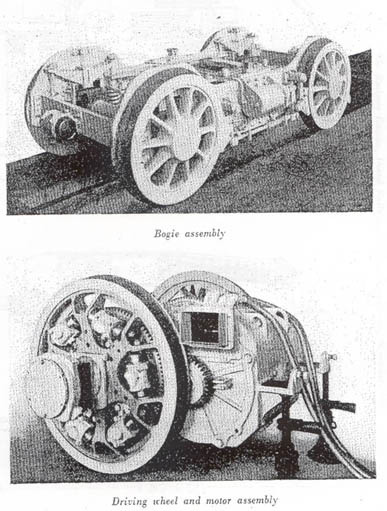 A ninety cell cadmium nickel battery was fitted for use in motoring the generator and other support systems, split equally in each half unit, located near the cab. The underframes were built up of one inch thick welded steel plates, with substantial cross braces at the ends and at the bogie pivot points. Less substantial transoms were placed above each motor axle and between the axles to serve as supports for the traction motors. The entirely suspended motors are fixed to the frame by two supports on the side opposite to the axle and by a midway fastening to the upperside of the motor body. The bogies with interior frames and oil boxes have a spherical pivot and are fitted with a centring system of laminated & coil springs in combination. A bogie axle adjoining the central coupling actuates the 6kW nose suspended exciter used to regulate the main generator set. The locomotive was originally intended to haul the 'Cote d'Azure' express between Paris and Nice or Mentone, returning the next day with the northbound working. Servicing and traffic reasons quickly found these plans replaced by the locomotive working a return day trip between Paris and Lyons, a daily mileage of 635 miles with average speeds of 56 - 60 mph on 350 - 450 tons trains prior to World War Two. After the war the average speed dropped to 50 - 52 mph but the loadings increased from 560 - 750 tons. The route was mostly undulating but included a continuous rise over eighty miles between Laroche & Blaisy-Bas. After the electrification of the Laroche - Dijon route the locomotive transferred south to cover the Riviera expresses, including the Blue Train, between Lyons & Nice, a return trip of 700 miles every twenty four hours. Due to track conditions existing at the end of the War the locomotive's top speed was limited to 120 kph (75mph), prior to the War 140 kph (87mph) was possible. Between November 1937 and February 1938 the locomotive covered over 150,000km in regular service, at the end of February 1938 it was required for some special tests. New types of blades were installed in the Rateau turbo charger after the originals failed, for a while portions of the engine operated without pressure charging. Tests revealed that on a curved 1 in 125 grade with a trailing load of 535 tons a speed of 50mph could be achieved in four and a half minutes over 3.5km. A top speed of 60mph under these conditions would be achieved in seven and a half minutes. Between July 1938 and the outbreak of war on September 3rd 1939 the locomotive ran 138,000 miles. During the hostilities the locomotive was stored, being recommissioned in June 1945, covering another 490,000 miles up to January 1950 principally on the Paris-Dijon route. It had recently received an intermediate repair, but following an accident it then received a general repair. 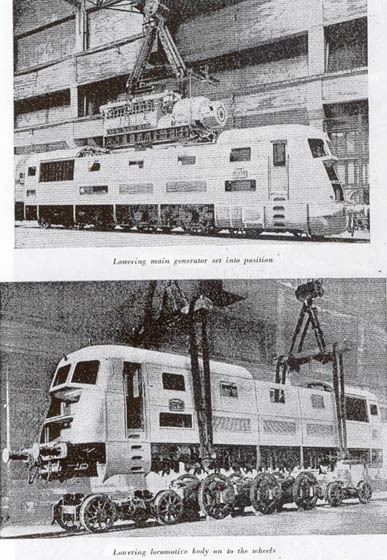 Another view of this pioneering double unit locomotive. Since 1938 it had received three general overhauls and six intermediates. At the 1950 general overhaul the two power units still had the four original carbon-steel crankshafts. Of the twenty four original forged aluminium alloy pistons, only two had been replaced, in the 'B' unit. The cast iron cylinder heads and the fuel injection pumps were all original. A total of thirty two Sulzer fuel injection assemblies were orders as spares to the twenty four in the two engines, allowing for a rotation of these assemblies when cleaning became neccesary. Each cylinder had one inlet and one exhaust valve, the exhaust valves were all originals, four inlet valves had been replaced, one in the 'A' unit and three in the 'B' unit. Before the War two split pins from the big-end bolts were found in the sump, as a result these were replaced by big-end bolts & nuts with a patented toothed locking arrangement, no further trouble was experienced in this area. Two of the original nickel-chrome steel connecting rods in the 'B' engine were replaced. Two parallel crankshafts drive the 1,420kW main generator through a step-up gearing. The main bearings - whitemetalled steel shells - have only needed four replacements, three on the 'A' unit and one in the 'B' unit. The big-end bearings are of bronze shells with white metal linings. For the twenty four rods in the locomotive, eleven top-half shells and eight bottom halves have been renewed in the 'A' engine and thirteen top halves and thirteen bottom halves likewise in the 'B' engine. The small ends needed practically no attention. They are of the stepped type with greater bearing area over the bottom half, only one has needed renewal, in the 'B' engine. The gudgeon pins are the originals, except for two where new pistons were installed. Following the end of the War corrosion of the wet type cylinder liners became an issue, not only in this locomotive but in much of the French diesel & railcar fleet, and in many other countries too. Water treatment of a comprehensive nature eliminated this problem, but not before the replacement of sixteen liners in the 'A' unit & fourteen in the 'B' unit. Rateau exhaust gas turbo pressure-charging groups: began to show defects by 1948, as these were non-standard components the delivery of spares was heavily delayed, such that for 129,000 miles one engine ran normally aspirated. The electric control system embodying automatic regulation of engine output according to the inlet air pressure was able to handle this condition, though the power unit suffered greater thermal stresses and the internal condition was dirtier. 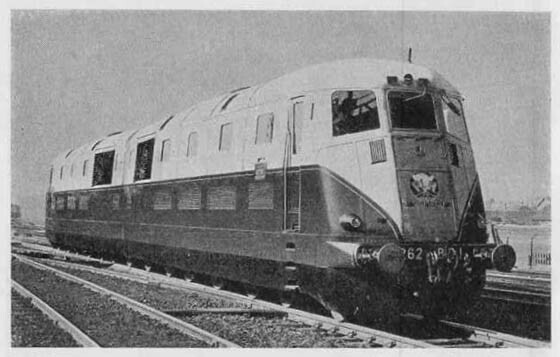 The Sulzer powered 262BD1 was one of a pair of twin units ordered by the PLM, the second twin unit, 262AD1 is shown above, this machine was powered by four MAN 1,050hp engines. Fittings on the locomotives were standardised where possible to keep spares to a minimum, likewise the bodyshells reveal much similarity. Based on articles in Diesel Railway Traction, July 7th 1939, October 1945 (supplement) & August 1950. Page updated October 22nd 2005.